Introducing the Coag-Sense™ PT/INR Monitoring System. The first PT/INR system to directly detect clot formation representing a breakthrough in PT/INR testing design simplicity! To order this promotion add sku# J0210-MD06F23 to your cart. 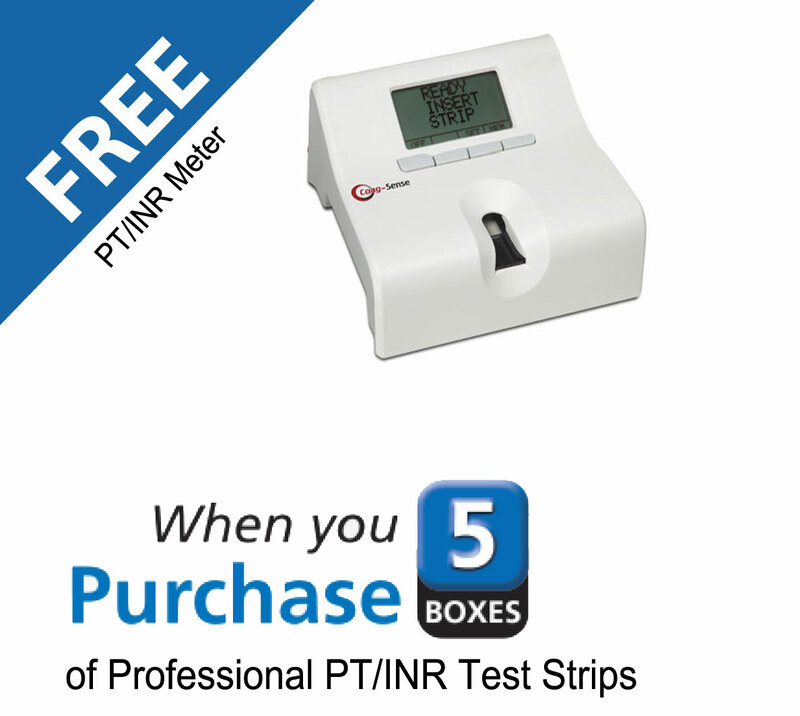 The Coag-Sense meter directly measures the prothrombin time, so the time required to perform a test is the actual prothrombin time in seconds. By not using look-up tables or curve fitting algorithms, the Coag-Sense meter offers both speed and accuracy. Coag-Sense's patented micro mechanical detection system delivers superb precision and reliability. Professionals testing with the Coag-Sense system have demonstrated %CV's of 2.5%. Unlike electrochemical detection based devices, the Coag-Sense system does not rely on the concentration of blood constituents not involved in clot formation to produce results. This improves precision and reduces variability in readings often seen in other systems. Because the Coag-Sense system uses a micro mechanical means of clot detection instead of electrochemical, re-calcified plasma control strips can be run as easily as whole blood. This also means that the Coag-Sense system is not affected by low hemoglobin or hematocrit levels, a common source of inaccurate results in systems using current to detect clot formation. Only 10µl of fingerstick sample is required to run the Coag-Sense system. To reduce strip waste caused by unsteady hands, sample is easily transferred from the patient's finger to the test strip using the minipipette or sample transfer tubes provided. The purpose of quality control testing for a prothrombin time test system is to verify the integrity of both device and reagent performance. 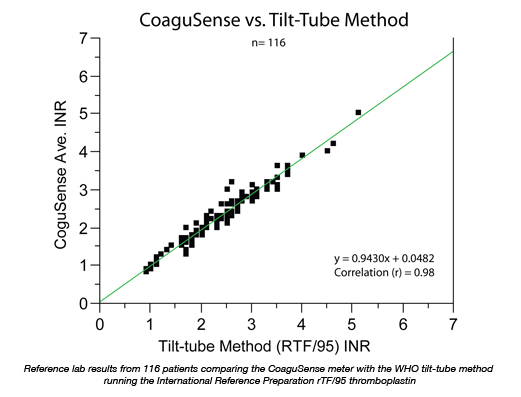 Coag-Sense is the first system to offer true high and low control strips which contain the same thromboplastin used in the patient test strip along with plasma of known INR. There is no substitute for confirming performance of the actual thromboplastin used in the patient test strips. When clinicians and researchers want the most accurate means of determining prothrombin time, they turn to either the World Health Organization (WHO) mechanical tilt-tube technique or the Fibrometer. Both these methods use a mechanical approach to directly detect clot formation, but they are cumbersome to perform. The new Coag-Sense PT/INR Monitoring System represents a breakthrough in point-of-care prothrombin time monitoring technology by miniaturizing and simplifying a direct mechanical means of detecting clot formation. 2014 Medicare National Limit: $5.37.